Network) activities, Norwegian opera singer and music teacher, Björn Björn, has died at a Stockholm hospital after a long illness. Aside from his professional work as a singer and teacher, Haugan performed voluntarily at a number of rainbow cultural events arranged by Tupilak and by the ILGCN, including IDAHO (International Day Against Homophobia) events in the Swedish capital – singing cheerfully and powerfully even from his wheelchair in the last years. 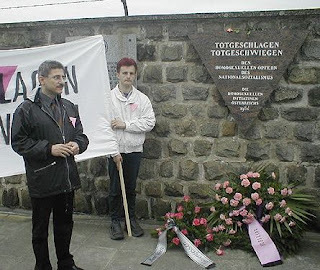 Björn Haugan was especially proud of his participation in 2002 in an ILGCN-arranged “Nazi & neo Nazi Persecution of Homosexuals” event in Linz, Austria, co-arranged at a city theater with the Austrian LGBT organization, HOSI-Linz, and including a rainbow ceremony at the near-by Nazi concentration camp, Mauthausen, where Haugan sang Wagner’s “Liebestod” at the gathering in front of the camp’s pink triangle monument marked “Beaten to Death, Silenced to Death” -- honoring the LGBT prisoners who were interned, tortured and murdered in the camp. Björn Haugan carried out the visit to Austria despite severe pains from his diabetes.
. A memorial concert will take place on Saturday, February 7 at 17.00 at Sofia Church in Stockholm.